JCB today announced plans to open a new facility in North Staffordshire in a move which will create hundreds of new jobs. The company – which currently has 11 plants in the UK and 11 overseas and is the world’s third largest manufacturer of construction equipment – is creating a new logistics hub on land next to the A500 in Newcastle-under-Lyme. The facility will open in the environmentally-friendly Blue Planet warehouse on the Chatterley Valley site. JCB has agreed a long-term lease for the building and has been conditionally offered £2.9 million from the Government’s Regional Growth Fund to support job creation on the site and to provide training programmes. In addition, the company has also signed an option to purchase an adjacent 7.7 acres of land from Newcastle Borough Council to facilitate future expansion. The distribution hub will be commissioned this month and by the end of the year will employ around 60 people. Employment levels are expected to rise to more than 300 people once the facility becomes fully operational in the next two years. Business Secretary Vince Cable said: “We need growth that is more evenly balanced across the country. That is why we are supporting firms such as JCB through the Regional Growth Fund, which will enhance their infrastructure and bring long-term employment to the area. JCB CEO Alan Blake: “Staffordshire is where JCB’s business started nearly 68 years ago and I’m delighted that our latest expansion is creating jobs in the county which has been our home for so long. Staffordshire is a fantastic place to do business and this site offers some huge advantages for JCB, particularly with transport links to the A500 and M6. The facility will be run by a global logistics partner, which is now undertaking a recruitment drive to fill a number of positions which are available immediately. The Blue Planet warehouse is one of the UK’s most environmentally-friendly buildings with rainwater harvesting facilities, optimised use of natural light and the deployment of sustainable and recyclable materials in the construction and fitting out of the building. 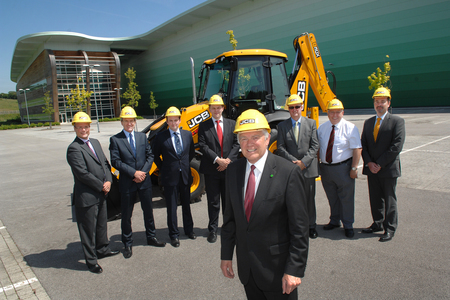 The facility – which will be branded JCB – will be the central receiving hub for supplier-bought components used in the manufacture and assembly of JCB machines. It will serve JCB’s UK plants as well as JCB’s compaction equipment factory in Germany and JCB’s newest manufacturing facility in Brazil. Gareth Snell, Leader of Newcastle-under-Lyme Borough Council, said: “This announcement is the result of a lot of hard work and careful negotiation by council officers and our partners over many months. Gazeley’s Blue Planet building is an inspirational development that we are extremely proud to have in the borough and we feel that JCB is the ideal company to occupy it. Blue Planet was speculatively developed by Gazeley, achieving the world’s first BREEAM ‘Outstanding’ certification for a logistics building. It combines a highly specified logistics warehouse with cutting edge sustainable technologies – each designed to deliver significant operational cost savings to the end-user together with reduced carbon emissions.